There comes a time in every camper’s or backpacker’s life to stop going solo and bring another person – and this is where tent capacity ratings come into play. Now, the first thing you need to know is that even the best 2-person tents won’t offer much comfort for two people, and this is something you’ll notice in every tent size. 8-person tents don’t actually sleep eight, just like 4-person tents are much better suited to couples – the safest thing when shopping for a tent based on its capacity rating is downplay it by two. Don’t take this the wrong way, most two-person tents will still sleep two people, but there won’t be much free space – you’d have to get real up close and personal with your bunkmate. The Coleman Sundome 2 is a 2-person self-contained tent, meaning it comes with a sealed floor and everything you need to pitch it – this includes stakes, poles, guy lines, rain fly, as well as several carrying sacks to fit it all in. It’s a bit on the heavy side (mostly thanks to the heavy duty fiberglass poles), so it’s not really meant for backpackers, unless it’s on shorter distances. The polyester rain fly provides a small peaked porch, which isn’t really usable in terms of storage, but it does provide some added protection from the rain. Once you’re fully zippered in and the fly is on, the Sundome should keep you and your stuff bone dry, even in a downpour. Here’s the kicker, though – the Sundome features heavy duty fiberglass poles, which go a long way to keeping it in place even in 35+ mph winds (provided it’s staked properly, of course). On that note, this is a freestanding dome tent, so you needn’t really stake it unless you’re expecting winds. The floor area measures in at 7 x 5 feet, which is more than enough for two adults to sleep, albeit rather too snuggly. Combined with 4 feet of head height and nearly vertical walls, however, this gives you more than enough room for backpacking solo. Speaking of which, keep in mind that this isn’t a 4-season tent, though you could conceivably use it as a 3+ season (from early spring to late fall), taking into consideration how well it handles water. It is, however, perfect for summer, since the two mesh windows provide more than enough breathability. The tersely named Camping Tent from BFULL is a nice choice for all the campers and backpackers who like to do some stargazing on their outings. Of course, you won’t be able to watch the skies with the rain fly on, but the inner tent features quite transparent fabric (which, incidentally, also makes it amply breathable). This design is perfect for summer camping, but can also take some light to medium rain with the fly on. Speaking of weather, the fiberglass poles might be able to withstand some light wind, but the tent material is too lightweight to survive heavy winds. It’s a nice freestanding tent, but not much else. The setup is ridiculously easy and can be done in under 5 minutes by a single person – all you need to do is snap the poles together and then clip the rest of the tent on. Pulling it down is just as easy, and it packs down to about 18 x 5 inches (not ideal for backpacking, sure enough, but it does come with a carry bag, which makes it a bit easier). As for the floor area, it measures in at 82 x 55 inches, which makes it just enough for a full sized air mattress (you might even be able to fit a blow up queen, but it’d be a tight squeeze). In other words, despite being advertised as a 1–3-person tent (so, a 2-person tent, basically), it can barely fit two adults. With that in mind, you’ll probably best use it on your lonesome or give it to your kids. As you may have heard and read ad nauseam, 2 person tents aren’t really designed to sleep two people with much comfort (unless you want to get real up close and personal with your bunkmate). So, if you’re looking for something to fit you, another person and both of yours gear inside, the ALPS Mountaineering Lynx 2-Person Tent may not be the thing for you. On the flipside, if you’re looking for something to fit your two school age kids, or backpacking by your lonesome, then you just might like it. The floor area measures in at 60 x 90 inches, and stands 46 inches tall (plenty of room to sit up comfortably). It comes with a gear loft, which should somewhat make up for the relatively small floor area, but you’ll still need to keep your backpacks outside if you’re camping with someone else. While we’re crunching numbers, it’s important to note that the tent’s pack weight is just shy of 6 pounds (5.81, to be exact), which might be an issue if you’re trekking a long way to your campsite. 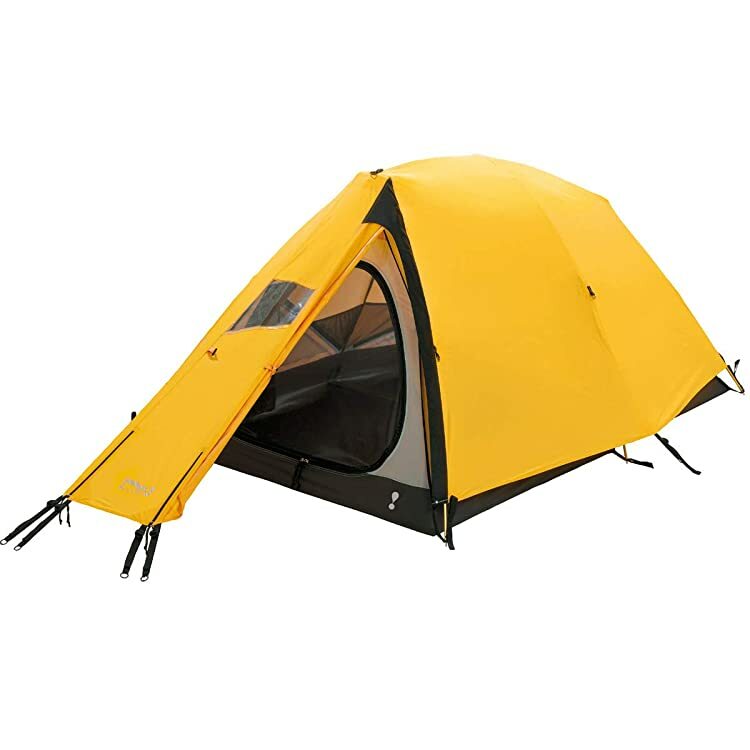 The Lynx 2 is a surprisingly durable dome tent for the price range, and comes with quite breathable mesh panels for ventilation. Of course, this is severely impeded by the rain fly, but this is to be expected. On the flipside, you and your gear should be nice and dry even in a downpour thanks to said fly. Speaking of which, it also gives you two small vestibules for each of the doors, which adds just a little bit of storage space (still, nothing to write home about). The zippers are not really up to par in terms of durability, and the tent could use heavier grade. Much like most 2 person tents, the Kelty Salida 2 is too small for two people to sleep comfortably, unless they knew each other intimately (wink wink). On a more serious note, the tent will indeed sleep two adults (snuggly) or two kids (comfortably), but if you want to have plenty of room for you and your gear, you’ll use it on your lonesome. The floor area measures 88 x 55 inches, while the center height is a comfortable 43 inches (3-foot 7, not nearly enough to stand in, but plenty of room to sit upright, which is all a backpacker needs). The total weight (pack weight) is 5.86 pounds, which is considerable if you’re walking to your campsite, but if you’re a car camper, then it’s pretty inconsequential. If you want to be perfectly safe from moisture, you’d do well to add a tarp underneath the footprint (cut it to size or keep it a bit bigger than the footprint, but roll it under the edges to keep water from breaking in). On that note, the rain fly performs superbly in this regard, and won’t let in any water, even in a downpour. However, it sits too close to the inner tent, which makes a bit of a problem when it comes to condensation (not really breathable). However, the major selling point of the Salida is how easy you can pitch it – the color coded hug clips go a really long way to making a foolproof setup. All you have to do is snap the two poles to length and clip everything in place, and you’re good to go (or stay, rather). The Mountainsmith Morrison 2 person 3 season tent is pretty much what it reads on the tin – a nice little tent that should withstand winds of about 10 to 15 mph, as well as some moderate rain. The rain fly is of surprising quality for the price range, and it does a great job of deflecting water, and it also provides two small vestibules above each of the doors. However, the added storage area you get from these is so small that it’s practically unusable. On that note, the two door design is indeed convenient, as you don’t have to climb over your bunkmate to get to your sleeping bag that’s on the other side of the tent. Now, another minor gripe about the tent is again related to the rain fly, as its position makes it rather difficult to reach the door zippers from the outside. The doors still work well and you have easy access when they’re open, but in a hurry, the zippers can be a bit frustrating. On the flipside, the aluminum poles are of good quality and easy to assemble. Each is color coded and breaks into very small pieces, which makes breaking down, packing it and storing quite efficient. Now, unlike most tents advertised as 2-person, this one actually sleeps that many people, and still has some room for gear. For example, it could sleep two 6-foot tall people, no questions asked. It’d be a tight squeeze, but comfy enough. As for specific numbers, the tent has 35 sq. ft. of floor area (92 x 56 inches), with 46 inches of center height and a dome design. The trail weight (so, just the tent body, poles and rain fly) is about 4.75 pounds (5.56 pounds pack weight), which isn’t ideal if you’re backpacking, but for a car camper, it’s negligible. So, with the abovementioned caveat in mind, let’s briefly discuss the key features you’ll want to look out for when shopping for your new (or first) 2-person tent. Of course, if you’re a seasoned camper, feel free to skip this section and skip right ahead to the reviews. So, without further ado, let’s get stuck in. The first thing you’ll want to check out when buying any tent is its seasonality. For those of you not in the know, this refers to the type of weather conditions the tent will be able to protect you from. Moreover, it’ll also heavily impinge upon the kind of fabric the tent will use, and, in turn, the price tag. Painting with a broad brush, there are three types – 3-season tents, 3+ season tents and 4-season tents. Three-season tents are by far the most common type you’ll see on the market, especially for backpacking, seeing as they come with the most favorable weight-to-protection ratio. More often than not, a 3-season tent will have large, breathable mesh windows to improve air circulation and improve breathability. These tents thrive in mild weather, from late spring up to early fall, depending on the climate. As the name might imply, these tents are an evolution of the 3-season type. They have some added features that recommend them for a more extreme weather conditions than their more common brethren, but they’re still far off being a true all-weather tent. You’ll usually use them from early spring to late fall, when it’s a bit colder and the winds blow stronger, or lug them to high-altitude campsites with such weather conditions. They’ll be designed to keep you warm first and foremost, so they’ll feature stronger and sturdier poles, heavier fabric, as well as fewer mesh panels. Some will also come with rain flies that extend all the way to the ground in order to better keep the wind and the snow out. The footprint here doesn’t refer to the ground cloth you place underneath your tent to keep it from wear and tear, but rather to the floor area. So, with that in mind, let’s discuss why it’s important. The thing about tent sizes and capacity ratings, as we mentioned above, is that they rarely, if ever, correspond to each other. A 2-person tent will indeed sleep two people, and a 4-person will sleep four, but it’ll be more like packing sardines than camping. For this reason, you should always apply the rule of two when shopping – check out the capacity rating, and subtract two if you want to see how many people can fit comfortably, or divide by two if you want to see how many folks and all of their gear can fit and have some room to spare. When it comes to 2-person tents, you’ll usually see about 30+ square feet, which is indeed enough for two adults who know each other Biblically and some gear. As for the center height, aka head height, this is the height at the very center of the ten. A 2-person tent will usually be about 4 feet tall, which is more than enough room for the average person to sit upright. What’s more important is the tent model (dome, ridgeline, you know the drill) and at what angle the walls descend towards the base. Ideally, you should go for a dome tent. The weight of your tent is an important feature for reasons obvious even to laymen, especially if the intended use is backpacking. As backpackers carry all their weight on their back, every ounce counts, and you’ll ideally go as low as the quality of the fabric and poles allows you. Typically, aluminum poles will be lighter and more expensive, while their fiberglass counterparts will be heavier but less expensive. On a similar note, aluminum poles will bend when under duress, and you can probably fix them provisionally with some bending and hammering, but fiberglass poles will break and shatter, and you’ll have to replace the broken piece (or duct tape it, that might also work). Pitching the tent is certainly the most excruciating part of owning one (next to actually shopping for one, of course). You need to make sure whether you have all the stakes and guylines you need, if the poles are color coded (a big plus), how they connect to each other, the works. However, at times you might come across a freestanding or standalone tent, which implies they require no stakes. Still, they’ll more likely than not include everything you need to stake them, just to cover the eventuality of high winds in the area. A freestanding tent with all the pitching gear included is a good indication of quality and customer care. If you’re deciding between two similar models at the same price range, what might help you pick one is whether it has wall pockets or a gear loft (it’s exactly what it sounds like). Alternatively, an extra-big rain fly that makes a vestibule, two doors instead of one, heavy duty zippers instead of regular ones, these also can be something to edge you towards one or the other model. We’ve finally come to the end of our short list of the five best 2 person tents, so hopefully, you will have found out everything you need to know to make an informed decision when shopping on your own. As for the top rated 2 person tent, specifically, no clear winner comes to mind – there are too many factors to consider. However, if it’s bang for the buck you’re looking for, the Coleman Sundome is certainly it – granted, it’s a bit hefty for a backpacker and runs too small for two people, but it does have the best price-to-quality ratio. On the flipside, if you’re looking for a 2 person tent that actually sleeps two people (crazy notion, isn’t it? ), you might be happier with the Mountainsmith Morrison. So, do you agree with our list? Are there any interesting camping stories with one of the products on it you’d like to share with other readers? If so, please, feel free to leave a comment. Until then, happy camping!